81 applications were received from 17 UWC schools and colleges. For the first time students from UWC Costa Rica, UWC Thailand and UWC ISAK Japan will be receiving GoMakeADifference grants. 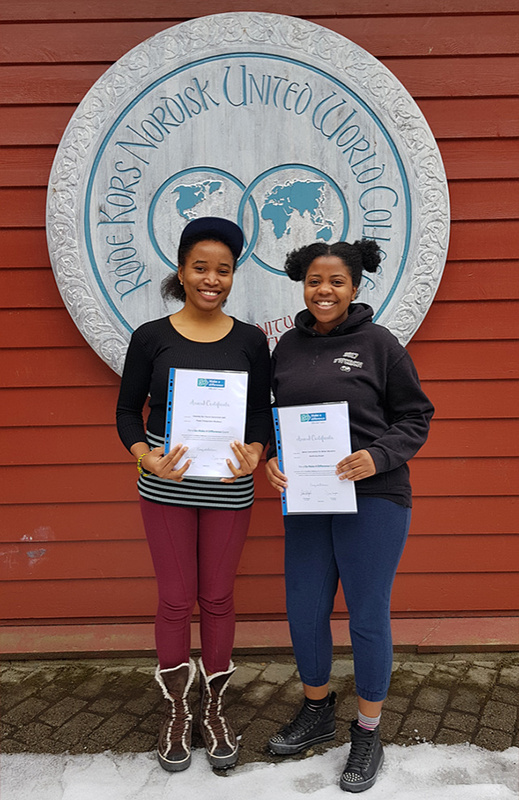 Peace Chiagoziem Mojekwu and Novihelha Moleni, students from UWC Red Cross Nordic with their 2018 GoMakeADifference award certificates. Talking about the grant scheme, co-founder Colin Habgood said, “Jill and I were overwhelmed by the number of applications we received this year. With more than 80 applications to consider it made the process of assessing which projects should be awarded a grant very interesting and challenging. The standard of applications was high - innovative projects, with well-thought through and budgeted plans, demonstrating significant levels of commitment from students to live the UWC mission immediately after they graduate”. Jill Longson (co-founder) added: “It is inspiring to see the initiatives UWC students have proposed to GoMakeADifference this year. Applications were so thought-provoking and reading each one of them was a truly humbling experience. Unfortunately, it is not possible for every application to be awarded a grant, but we hope that those students we couldn’t support, can somehow use their planning and thinking as a catalyst to fund and deliver their projects in another way”. From the 81 applications received, 31 UWC mission aligned and diverse projects will be supported across the following regions: 15 in Africa, 9 in Asia, 4 in Americas and 3 in the Middle East and Europe. “Less Tear Drops, More Water Drops”, to be run by Pelin Turkmen (UWC Mostar) - providing a sustainable function of clean purified water for 600 families in Jinja, Uganda. The project consists of building a solar water pump that will include a water treatment system. “Project Krishna” from Apoorba Misra (UWC ISAK Japan) - providing basic living necessities of clean water and electricity, to a rehabilitated village of tribal communities in India who lost their lands to coal mining. "I am not a criminal” will be run by Hei Kiu Au and Gwyneth Goh (UWC LPC). They plan to raise awareness in various schools (Hong Kong and Malaysia), regarding the issue of refugees in Malaysia. “Let's give them the power” by Kiswendsida Yvonne Mathilde (UWC Robert Bosch College) - assisting women, in particular widows, in rural areas, providing skills and essentials to start local chicken farming on a small scale. “B for Bricks” led by Roba Anna Wani Justus Lobworong (UWC Thailand) - creating sustainable projects to support educational development, rebuilding schools that have been affected by natural disasters one brick at time through the sales of customised bags, straws and covers. “Revitalizing the Extraordinary Seeds of Swaziland”, led by Vanessa Chonyera and Angelo Kristian Dumaraog (UWC Waterford) - implementing a sustainable agricultural plot for the Motjane Hope House orphanage in Swaziland to help provide basic needs for the Motjane community, of 150 children. 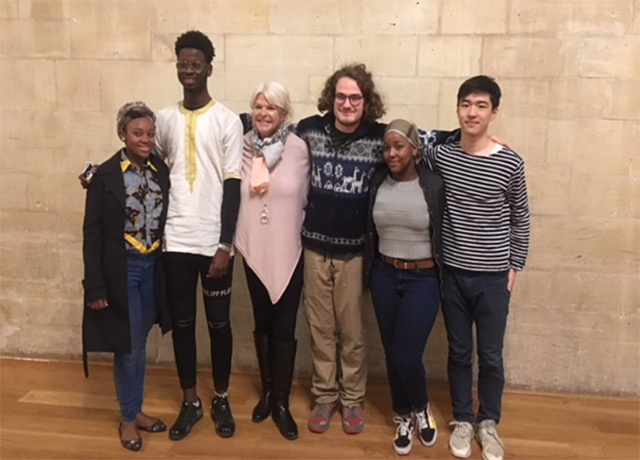 UWC Atlantic College students, left-to-right: Pearl, Johan, Jill (co-Founder of GoMakeADifference), Francoise, Shania and Takashi. Everyone at GoMakeADifference look forward to receiving the insightful end of project reports from UWC projects leaders on how you get on, what you have learnt and what you then reflect on. We wish you well! We would like to thank all who applied and the local UWC school/college coordinators who helped promote the award scheme. Project Title: Better Environment for Better Education Project Leader(s): Novilhelha Moleni College: UWC Red Cross Nordic Project Location: Malawi, South East Africa.